Since 2008, busy managers by the tens of thousands have turned to this best-selling book as a handy guide to the ins and outs of human resources. And no wonder! 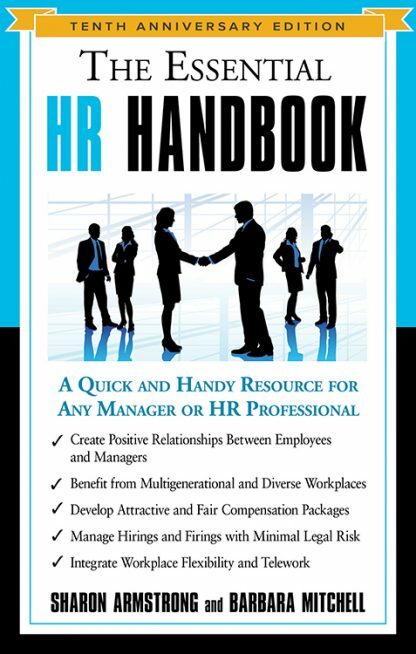 Because whether you�re a small business owner, a manager in a business without an HR department, or even a seasoned HR professional, The Essential HR Handbook will help you handle any personnel problem�from onboarding to outplacement�quickly and easily. This fully updated 10th anniversary edition is packed with information, tools, checklists, sample forms, and timely tips to guide you through the maze of personnel issues in today�s complex business environment. Whenever personnel problems arise, having The Essential HR Handbook on your bookshelf is like having a team of expert HR consultants at your beck and call! Sharon Armstrong began her career in human resources in 1985 and held a number of progressively responsible in-house HR roles prior to starting her own consulting business in 1998. She now runs the Trainers & Consultants Network, brokering HR professionals. She is the author of The Essential Performance Review Handbook. Barbara Mitchell is an author, speaker, and management consultant. She is the coauthor of The Big Book of HR, The Essential Workplace Conflict Handbook, and The Conflict Resolution Phrase Book. After a long career with Marriott International, she is now managing partner of the Mitchell Group and works with a variety of clients to help them attract, develop, engage, and retain the best talent.